Covering Georgia’s midterm elections this year was not for the faint of heart. They went on for a long …. long time. I was up until 3am covering the first election night, and then up again two hours later to be interviewed live on NPR nationally at 6am. The Governor’s race went on for about 10 days after that. One candidate declared himself the victor and proceeded with his transition while the other refused to formally concede, organized lawsuits and highlighted the many issues people had while voting. There were recounts. There were (and are) many lawsuits. There were two runoffs just last week. One state house race had to be completely re-done, and is currently only separated by 2 votes (!). Days after those runoffs, I made my sports coverage debut, writing about Atlanta’s new championship soccer team, Atlanta United. Check out that story here. I wrote that story in advance of the team’s championship game Saturday, and then covered the game myself. It was quite the adventure, including time in the supporters’ section, getting whacked on the head by a fan flagpole, getting crushed in a sea of people in the locker room celebration after the game, and failing to keep the champagne sprays off my recorder. It was all worth it to see Atlantans ecstatic over the “broken curse.” Atlanta hadn’t seen a national sports championship since 1995. I had a lot of fun putting together a “sound postcard” with the audio I gathered on that game night here. Here’s a scene from inside the team’s tarped up locker room, featuring champagne and ski goggles. And then yesterday, I wrote about the state high school football championship. A team from a hurricane-battered town in Southwest Georgia has been on a surprise winning streak since the storm. But never fear. I’m going to be back on politics in the new year, covering Georgia’s General Assembly session from January. It has taken this long, a mountain of phone calls and emails and one frigid trip to rural Kentucky, but I am so excited to share the final product. I'll let it speak for itself. Three decades after farmers first cultivated Périgord truffles in the U.S., no one has succeeded commercially. These intrepid growers are still pursuing the prize. On a frigid winter day in southern Kentucky, Margaret Townsend crisscrossed her family’s farm, following Monza, a truffle-sniffing dog hired for the day. They were hoping to find black Périgord truffles growing in the roots of the 4,800 hazelnut and oak seedlings Ms. Townsend planted in 2011, after her father read an article about cultivating the fungi. Ms. Townsend, an industrial engineer and a former executive at Microsoft Corp. and General Electric Co. , hasn’t had a harvest yet from the trees, inoculated with truffle spores before planting. But she’s undeterred as truffles take on average five to seven years to come to fruition. Three decades after farmers first cultivated truffles in the U.S., no one has had long-term success growing them commercially. Those in the business estimate that only around 25 orchards in the U.S. are producing any volume of Périgord truffles today, most bringing in just a few pounds per season. The venture is expensive. It costs $12,000 to $14,000 per acre to establish an orchard, plus $2,000-$3,000 per acre annually to maintain, says Charles Lefevre, a mycologist and founder of the seedling nursery New World Truffieres in Eugene, Ore.
Monza and her trainer, Lois Martin of Truffle Dog Company, hunted for the underground fungi at Margaret Townsend's orchard in Holland, Ky., in December. Margaret Townsend and Tom Michaels walked the grounds during the truffle hunt. Jackson Family Wines in Santa Rosa, Calif., harvested a 12.75-ounce black Périgord from its truffle orchard in January. The farm produced its first truffles last February, six years after planting. Monza is a Lagotto Romagnolo, an Italian breed that has been truffle-hunting for centuries. 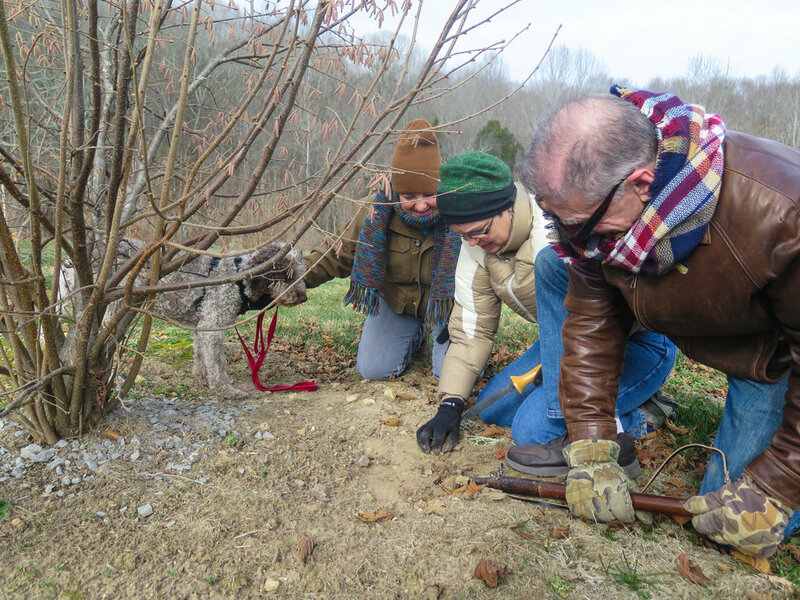 From left, Margaret Townsend, Lois Martin and Tom Michaels dug at a spot where the dog Monza sniffed out a native truffle. A dish from New York chef Gabriel Kreuther's restaurant featuring black truffle. Mr. Kreuther says access to locally grown truffles would ‘change the quality landscape’ in the American culinary world. Finding the formula for successful truffle farming is a tantalizing goal for would-be growers in the U.S., who range from fungi scientists to vineyard owners to former tech executives. Among the hundreds of species of these underground fungi, only a handful have true culinary value. Two, with earthy aromas, are prized above all: the French black Périgord, or tuber melanosporum, which sells for $800-$900 per wholesale pound and the Italian white Alba, or tuber magnatum pico, which runs $3,000-$4,000 per pound. Traditionally these delicacies were only found in the wild. Today, the white truffle continues to elude cultivation. However, outside of the black Périgord’s native France, producers in Spain and Australia have succeeded in growing large volumes of the truffles also known as black diamonds. American demand is growing. About 426 tons of fresh, canned and dried truffles were brought into the U.S. in 2017 according to the Department of Agriculture, up 75% from 2010. Fresh imported truffles usually take at least four days to get to the U.S., giving chefs a short window to use the highly perishable commodity. 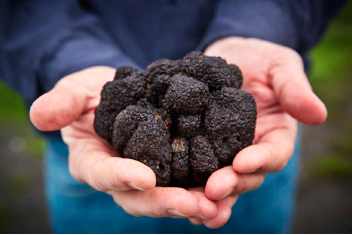 Aspiring U.S. truffle farmers have faced steep hurdles. Getting a foothold in this risky venture requires big money up front and the ability to wait years for a crop that may never materialize. Many blame the lack of large American volume on the challenges presented by indigenous pests, natural fungi competitors and diseases. Reliable scientific information on basics like soil chemistry needed for truffles is hard to come by, and there is little funding for U.S. research on this exotic crop. Back in 2007, it seemed that Tom Michaels, an expert in button mushrooms, had cracked the code for producing American truffles. He planted his truffle orchard in Tennessee where he believed the soil and climate echoed that of the Périgord region of France. His bet paid off, for a time. The Chuckey, Tenn., operation produced about 200 pounds per season at peak and seemed to prove the possibility of commercial viability. He also showed Tennessee truffles could hold their own against the international incumbents. Gabriel Kreuther, the French chef and owner of his eponymous New York restaurant known for his truffle dishes, says he was “beautifully, pleasantly surprised” by the quality of the Tennessee Périgords. Then a hazelnut blight hit the East Coast, and by 2016 nearly all of Mr. Michaels’s truffle-producing trees had died. He is disappointed in the state of the industry. “There are so many unknowns. You’re dealing with such a paucity of knowledge,” he says. Basic soil chemistry that traditional farmers normally know off the tops of their heads like proper nitrogen and phosphorous levels are still up for debate when it comes to truffle cultivation, he says. Does Mr. Michaels really understand how to grow truffles, for all his experience? “Kind of,” he says. “We’re sort of writing our own book right now,” says Brian Malone, truffle orchard and vineyard manager at Jackson Family Wines in Santa Rosa, Calif. The farm harvested its first truffles last February after six years. Robert Chang, who founded the American Truffle Company in 2007 after leaving his director post at Yahoo Inc., touts a scientific approach. “I think we still have a ways to go, but we are definitely well past the first adoption,” he says. The company offers a partnership model to its clients. Tom Michaels’s success continues to spur hope. In Kentucky, Ms. Townsend hired him in December to consult on her first truffle hunt, along with the dog Monza and her trainer from Truffle Dog Company. Monza is a curly-haired Lagotto Romagnolo, an Italian breed that has been truffle-hunting for centuries. Trained dogs can determine truffle ripeness in a way humans haven’t replicated. Ms. Townsend, a senior vice president at J.B. Hunt Transport in Arkansas, leased 48 acres of land from her parents and planted the seedlings on 24 acres to allow for a buffer from the native woods nearby. Her late father shared her enthusiasm for the venture she named NewTown Truffiere, building a noise-making device to scare off deer nibbling the fledgling trees. On this debut outing, Monza didn’t find any Périgords, though she did sniff out one native truffle without much value. She’s scheduled for a return visit later this month. Another of my final Arkansan stories was a feature of a small startup doing some big, revolutionary work. A team of four at Ascendant Dx in Springdale, AR is working to completely change the way breast cancer screenings happen. They've developed a test that detects breast cancer biomarkers in human tears in under 30 minutes. It will cost $99. Right now, mammograms are all we've got. They're only about 50% accurate, they're expensive and annoying. Plus, most of the world doesn't even have access to them. Without mammograms, those women generally only find out they have breast cancer once it's advanced enough for them to have symptoms. As Omid Moghadam, the CEO of Ascendant pointed out to me, this is exactly the same way the first documented case of breast cancer was discovered 2,000 years ago in ancient Persia. 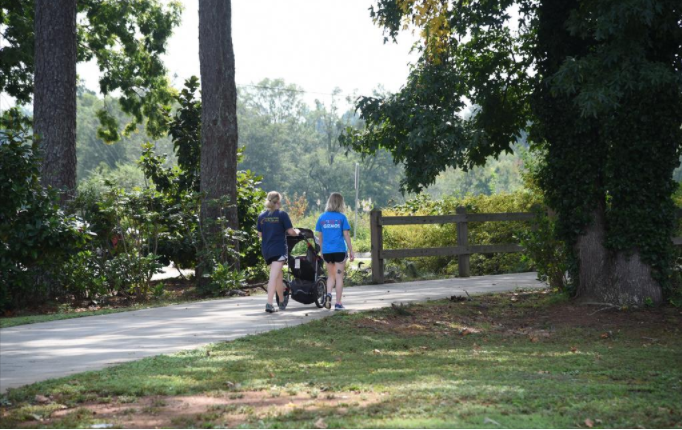 Ascendant Dx has been in the works in Arkansas for over 10 years now, and the team is now working towards full clinical trials and looking for funding. It's slow going as no one uses tears for any diagnostic testing, and the group is having to collect all their own samples manually. However, since blood is condensed to make tears in our systems, they claim this is a powerful substance with big potential to diagnose even more diseases in the future. Lindsay Rutherford, senior scientist at Ascendant Dx, uses a Schirmer’s strip to make her eye water and test herself for breast cancer. I recently made the bittersweet decision to quit my job at the Democrat-Gazette and move to Atlanta. Bitter, because I loved my time in Arkansas, I learned a ton from my colleagues, and I met many lovely people. Sweet, because I already can tell this was the right decision for me, to be closer to friends and family. However, I still have a few Arkansas stories up my sleeve. One of them, which published this week, was particularly special. I was able to interview John Roberts, the CEO of J.B. Hunt. It was the first sit-down interview he has given in the six years he has been CEO. Plus, as the company has long been media-shy, any face time with a J.B. Hunt executive is a rare opportunity. We covered a lot during our conversation, from autonomous truck tech to the fact that J.B. Hunt is definitely not a trucking company anymore. Hope you learn as much as I did. Many people have asked John Roberts why he hasn't changed J.B. Hunt's signature yellow and black scroll logo. His answer is always the same. "I would say it is here for the long run," said the company's president and CEO of over six years in a recent interview. Despite that same logo, the actual business Roberts runs out of Lowell looks little like the trucking company J.B. and Johnelle Hunt started back in 1969. These days J.B. Hunt is working through things such as autonomous trucking and e-commerce, while maintaining a connection to its past. Even though the company still owns many trucks, Roberts said J.B. Hunt stopped being "just a trucking company" long ago. The J.B. Hunt of today, he said, needs "to be able to think like a supply chain company, and not just a trucking company, and even not just transportation." With that in mind, the company recently merged its brokerage division, Integrated Capacity Solutions, and its truckload division under one "Highway Services" sales and operational banner. He said they made that decision because, "In my mind, it isn't as important today whether a J.B. Hunt asset or contracted asset handles the load. We're just here to answer your question: Mr. Customer, what do you need? Mrs. Customer, how can we serve that lane for you? If you want drop trailers, OK, we have an answer there in Highway Services." He compared the "mode-agnostic" approach to the average consumer's indifference about which company fulfills an order they place online. John Kent, director of the supply chain management research center at the University of Arkansas, Fayetteville, said the approach is evidence of J.B. Hunt being a "leader." "They're saying, 'Hey its 2017, it's a modern industry that we're working in. We feel with the technology that we have developed we can integrate these units together operationally and market it that way to provide more value to our customer in ways that competitors can't,'" he said of the company. Roberts said keeping the same logo symbolizes a retention of the original ethos of the company amidst a changing 21st century supply chain. "Any time a company is named for a person, you find a different element flows through the business than if it's called 'Dynamic Insights' or something referencing the services provided," he said. "It has a different flavor to it." For Roberts, the innovative spirit of its co-founder and namesake still lies at the center of J.B. Hunt. "It's OK to hold onto your core value, especially if your core value system is disruptive by nature," he said, asserting that disruption has been a part of the company's history for decades. When Hunt decided to partner with the railroad to share freight in the late 1980s, he was taking a big risk on intermodal transport. Railroads and trucking companies had been fierce competitors, and Hunt made a daunting investment in all new containers and equipment. One nontraditional idea facing the J.B. Hunt of today and its industry peers is autonomous trucking technology. "Autonomous trucking is very real," Roberts said. "We will be very active in testing, as we are any new idea -- like natural gas and other alternative power systems, or import changes involving the Panama Canal." "We are not going to be caught looking over our shoulders saying, 'Why didn't we pay more attention to that?'" he said. When asked what J.B. Hunt would have thought about this new development, his widow and co-founder Johnelle Hunt said he would be all for exploring it. "He was always looking for something new and better. That's why everything came about the way it did, like intermodal." Roberts said the company began investing in autonomous technology about five years ago, when they installed automatic braking systems in all their trucks, which reduced rear-end collisions by 60 percent. But at 52, Roberts said he doesn't see the regulatory environment and the general population adapting to the idea of totally self-driving tractor-trailers in his lifetime. In regards to platooning, in which one truck can wirelessly control the speed and braking of others to save fuel, he said there remain "unanswered challenges" before a clear safety record and a good return on investment. "Switching lanes, navigating exits, merging, and regulations are some of the roadblocks we're finding as operations explore platooning," he said. Craig Harper, chief operating officer and the executive in charge of exploring autonomous technology and platooning, said new semi-autonomous technologies, including lane assistance and evasive maneuver assistance will be rolled out "as they are commercially viable." Harper said he expects the company to be involved in platooning sometime in 2018, referring to forecast statistics that show "a lead truck could use 4 to 5 percent less fuel, and the subsequent truck could consume approximately 10 percent less fuel." Ultimately, he said, "there is still a long way to go before we see major implementation of autonomous vehicles, platooning, and other such technologies," highlighting that the driver will remain an important component of any new developments. Another dimension of the company's evolution with today's supply chain entails hefty investments in new technology and a revamping of its over 20-year-old core operating systems. It has pledged $500 million towards technology over five years to rebuild the old, develop a new cloud infrastructure and continue working on its supply chain management platform, J.B. Hunt 360. After spending time with customer groups, Roberts said he realized J.B. Hunt could help its customers of all sizes as they adapt to the disruption of e-commerce. "They need to be able to see what's going on in their supply chains," he said. "They need to be able to alter what's happening, and now more than ever because of e-commerce." To provide that transparency and predictive analytics, Roberts said the company is working toward "a portal of aggregation" for all important parts of a supply chain. "The customers really, more than anything, want crisp, real-time data that they can use, that they can act upon," he said. Much has changed in the company as a result, down to the very language the J.B. Hunt team uses. "We used to use terms like induction, distribution, aggregation, retail replenishment, and now we're having to think about that differently," Roberts said. These days, he explained, the terms are "the first mile, the middle mile and the final mile." In 2015 the company brought in Stuart Scott as chief information officer to lead these efforts. He is the first executive to not have spent at least 20 years in the company. Roberts has been at J.B. Hunt for about 27 years. As Roberts recalled, "I told him, you're going to need to disrupt this company, and we're probably not going to like it very much. So, use my card when you need to and stay out of trouble." Roberts said that in a conversation with a division team, he impressed on them that one of the 360 applications has the ability to show a customer his optimal transport option. "If that means that your division is not the best answer," he said to the team, "you better figure out how to improve your value proposition, because we are going to give them the best answer." Roberts said the company needs to find and present the best value for its customers because, "if we don't do that, somebody else is going to. We can't be too overly committed to forcing business into our segments only for the sake of growing the segment," he said. "The right answer for the customer needs to win out over everything else," he explained. "That path will take us where we need to go." At the beginning of the year, I knew I wanted to spend some time at a CDL (commercial driver's license) school to learn about what kinds of people were signing up to be drivers and why. I didn't really know what story I would end up with. In the end, it took me about six months of going to classes and hours in truck cabs, plus talking, Facebook messaging and texting with drivers to figure that out. I just knew I wanted to stick it out with the guys until they made it into employment. (Yes, just guys in these classes--only about 7 percent of drivers are female.) I was trying to get a sense of what it really means to enter the truck driving market today. Like all stories, there are many sides to this one. However, my priority here was to let the narrative be driven by the lives directly impacted by the larger economic and industry forces at work. Hopefully that shows. When Corey Marler had to close his sheet metal construction company after an injury, the Rogers resident applied to a temp agency to pay his bills. It took months to get through their processes to start making money. Once he did, he could only find a job working nights at a signage factory in 95-degree heat for $11 an hour. Then he heard from a friend that trucking companies need drivers and enrolled to get his commercial driver's license, or CDL. Within days of submitting one application to a trucking company, he had dozens of emails and voice mails from trucking recruiters. He began work in a week. "It represents a new life," Marler said. "It puts the ball back in your court instead of somebody else's." The ease of entry stems from a driver shortage the long-haul trucking industry has been complaining about for decades. The average driver turnover rate falls around 90 percent, and companies work hard to attract people across the country with hopeful promises of better benefits and pay, autonomy and the open road. It's no accident that many trailers have permanent "drivers wanted" signs, though it all begs the question: Why has this problem persisted for so long? Bob Costello, chief economist for the American Trucking Associations, pegged the national shortage around 50,000 in 2015 and said there are several reasons for it. First of all, being away from home for weeks at a time wears on people, he said. Second, there is a "demographics issue" as a result of the minimum age being 21. "That means we lose out on all of those people coming out of high school," he said. The median age of a truck driver is 49, versus 42 for all professions, according to a report by Costello and U.S. Department of Labor statistics. The trucking industry also has trouble recruiting women, who make up about half of the labor force, he said. "You add all of this stuff up together, and we've got a labor shortage," Costello said. "I guess that's good news for current and would-be drivers. I don't care what you're short. You're short bottled water and the price goes up. You're short truck drivers and the pay goes up." The Bureau of Labor Statistics estimates that the median heavy-duty tractor trailer driver salary at about $41,000, compared with that of a textile or furnishing worker at $30,000. Trucking company advertisements commonly tout the longer-term possibility to earn closer to $80,000. As Doug Carter, founder of the Mid-America Truck Driving School in Malvern put it, "I firmly believe, and I've said it to my students many times, as long as you have this CDL in your pocket, it's like an asset." He said after leaving a career as an accountant in corporate America in 1982, it "represented a way for me to provide for myself and my family." The shortage, Carter said, "is a blessing for the drivers, but a curse for the carriers, shippers and consignees." Steve Viscelli has focused his sociology career on the trucking industry and even went out on the road as a driver himself at one point. He said many new drivers are "pushed" into trucking as a second or third career. For various reasons, like a shrinking industry or an injury, he explained, they have been "pushed out of a job" and are looking to maintain that income level. "They've had a decent or skilled job, and they lose it or want to move away from it," he said. "Trucking at least promises the ability to maintain that same income level. Even if it requires 50 or 100 percent more hours, they can still keep that income longer term." Then there are those "pulled in," he said, "looking for higher wages than they had earned previously." Diego Nava said he now makes about twice the money driving for Maverick Transportation than he had been making at a Wal-Mart distribution center. "I don't have to put up with another person supervising me," he added. "As long as I'm doing what I'm supposed to be doing, no one bothers me." "I'm still trying to get used to staying away from home for long periods of time," the father of two admitted. He said he makes it home most weekends. Viscelli agreed that drivers can make good money on the road, but that statistic often doesn't take into account that they can work twice as many hours to do it. "The initial money is very attractive to workers who want to go up in pay and can sustain those 70-80 hour weeks," he admitted. "A lot of workers who are maybe coming from lower-paying jobs are happy with that, except for the time that it requires away from home." "When you look at it, you've got 10 million CDL holders in the U.S. right now," Viscelli said. "But, only 3 million are using them. There is no shortage at all of CDL drivers. We've got 7 million sitting on the sideline, but for an industry that supposedly has a shortage, they can't attract the 7 million who have already trained for the job." One problem Viscelli highlighted is a misconception of immediate high pay, given that the estimates in recruiting and advertisements are calculated at top productivity potential. Most drivers, he said, become disillusioned because it takes time to reach that top productivity, so they earn less at first, especially taking into account the lower pay rates of mandatory training time. The statistics of unemployment offices can be skewed because it assumes a 40-hour workweek, Viscelli added. "They estimate that drivers make around $25 per hour whereas most drivers end up working for $10 per hour. Their calculations are off because they just don't know how much truck drivers actually work," Viscelli said, referring to nondriving work time, like waiting and loading time. "Really new drivers are very hopeful, and it's hard for them to negotiate the conflicting messages that they get," he said. After deciding between more than 20 companies, Marler completed his training with Crete Carrier Corp. and is driving on his own. However, he said, "I'm finding out some stuff that the recruiter neglected to tell me." He said the recruiter had promised 44 cents a mile. "I did all the math at 44 cents a mile," he said. After starting, he was told he has to work for six months at 36 cents per mile before the pay ramps up to 48 cents. "All my math figuring went down the drain," he said. Crete advertises its "experienced truck driver pay rate" of 46-49 cents per mile on its website. Marler also said he was not expecting to have to pay hundreds of dollars for a refrigerator, a converter, broom and cleaning supplies for the truck and trailer. Plus, the truck he was first assigned was filthy and had a melted dashboard. He has been home for a total of just over a week for the past nine weeks and said his work days have ranged from 10-17 hours with all the extra paperwork and trip planning. But he can't leave the company yet. "I've got so much time invested in it. If I go to another company, I'm going to repeat the entire process again. I would lose the months of training to start all over again, whereas come October I'll get the 44 cents." Steven Covington said he got behind on some bills because the training pay at USA Truck was not as much as he had expected. He was gone for two months before returning home unexpectedly for a few days for a funeral. Despite his original plans to stay out and travel long term, Covington said he has decided he will only stick with it for a few years until he gets his finances in order. He said he's seen the health issues facing drivers and has realized, "the road is not my life. I have other things to do." For now it's still better than his previous job managing a Whataburger at nights. "I miss the people, but I don't miss the work," he said. "It was killing me." After about five months of school, training and early stumbling blocks, Marler said, "I'm doing everything I can to stay here right now. When I devote myself to something I try to stick it out no matter how tough. Apparently for the next few months it's going to be nothing but tough," he said. "I've looked into it, and there's nothing else I can really go do right now and make $1,000 a week," Marler added. "That will at least keep the bills paid." As part of my coverage of Acxiom, Corp., I have also gotten to know its longtime leader, Charles Morgan who left the company in 2007. Since then, he has been busy. In fact, he took the helm of another company. As he put it, "I don't retire well." This Little Rock company, First Orion has some interesting parallels to Acxiom. The leadership team, 75 percent ex-Acxiom, used to use their big data expertise to help marketers target us. Now they are using it to help protect us from those pesky scam/span callers. The tables have turned, so to speak. If you're a T-Mobile subscriber you might have already noticed the "scam likely" messages popping up on your screen. That's First Orion's work, and they're in conversations with every major carrier, too. Until then, try their PrivacyStar mobile app for access to some of the functions. Through First Orion, CEO Charles Morgan is working to protect consumers from unwanted calls and scams. Longtime Arkansas technology leader Charles Morgan is concentrating his efforts on protecting consumers from phone scammers and spammers. Morgan's current venture -- First Orion -- has created a mobile application called PrivacyStar that offers blocking of unwanted calls, caller identification and the ability to file complaints against scammers. The company also offers an in-network solution that provides the customers of cellular carriers with an automatic "scam likely" message and the capability to opt into blocking unwanted calls. It is being used by MetroPCS, T-Mobile and Sky Mobile in the United Kingdom. A contract with Virgin Mobile is in the works, and Morgan said the company is in discussions with other major carriers. Will Wiquist, spokesman for the Federal Communications Commission, said unwanted and robocalls are the "No. 1" complaint the agency receives annually -- about 200,000 of 320,000. "As we talk to other people in the industry and potential investors, when you start talking about the problem you don't have to describe it for very long," said Craig Dunn, First Orion's chief financial officer. Morgan said developing the technology was difficult. "There are so many different people making so many different types of calls for so many different reasons," Morgan said. "It's really easy to get a weather warning that looks like a scam call." By studying the call patterns and characteristics of numbers, as well as calling some of them back, First Orion rescores its database of potential scam callers every six minutes. "Generally, robocall blocking and filtering services are a great tool for consumers," Wiquist said. "The more that they become available, the more power consumers have to pick the calls they want and don't want. That's helpful in avoiding scams and just in selecting which calls they want to receive." In 2008 -- a year after he left as the chief executive officer of Acxiom Corp. -- Morgan began investing in First Orion. Acxiom is a data broker and distributor that helps marketers target customers more efficiently. When First Orion nearly went bankrupt, Morgan increased his involvement and signed on as chief executive. He now owns 75 percent of the company. "Going into 2013, I had put a lot of money into this thing," he said. "I finally decided I was going to put more money into it, and I came to the conclusion that I should come in and run it instead of talking to these guys on the phone asking, 'What are you doing with my money?'" First Orion has grown to 100 employees, mostly in Little Rock, with smaller offices in Dallas, Seattle and London. Projected revenue for 2017 is $25 million to $30 million and the company has been profitable since 2013, except for the current quarter. Morgan estimated 75 percent of First Orion's executive team came from Acxiom, expertise that has proved valuable in a business with many parallels. "One thing I liked about Acxiom was the fact that we had so much data, there were so many infinite possibilities with the things we could do," Morgan said. "Likewise, there is an infinite amount of data in this business. Just at T-Mobile we see 1.5 billion network messages a day that we are doing analysis on." Kent Burnett, a former Dillard's executive and First Orion board member, said the team's experience with data has been crucial. "The common element is understanding the strategic issues of owning the data and monetizing the information in the data," Burnett said. "I've been so impressed by the innovation and creativity that comes from Charles and his team about what to do with the data," he said. "And that's something they did at Acxiom." "It's all the same thing," Morgan said. "There was an awful lot of data at Acxiom. We built solutions that leveraged large-scale data assets and created business value from them. It's a real simple concept." Of First Orion, Morgan said, "We're not an app company. We're not a network company. We are a data-driven solutions company that is leveraging large amounts of data to create value for our customers and for their customers." At both Acxiom and First Orion, developing a strong privacy reputation has been critical, Morgan said. "If they didn't feel secure giving us their data and the credit bureaus didn't feel secure giving us all their data in Conway, you know how long our business would have lasted? Moments," Morgan said of Acxiom's initial financial clients. At First Orion, Morgan said, "We want to make it very clear to everybody that we are going to do it like we did before," he said. Scott Hambuchen, executive vice president of technology and solution development, added his team looks at patterns and data and is "not pulling any of that information out of their network." "We don't look at who you're calling," said Morgan. "We look at the fact that you made a call." First Orion offers additional help to businesses to avoid scammers. For example, Dunn said scammers may call banks pretending to be account holders and gather enough bits of information to make a purchase. "We can help [businesses] understand whether the calls they are getting from the outside have all the characteristics of a good call," he said. "We are trying to enable the conversations both the businesses and consumers want to have happen." Now, the company is working on Caller YD, a feature that could eliminate the need to even speak on the phone. "When my wife has to call to change a prescription she spends an hour on the phone fooling around with it," Morgan said. 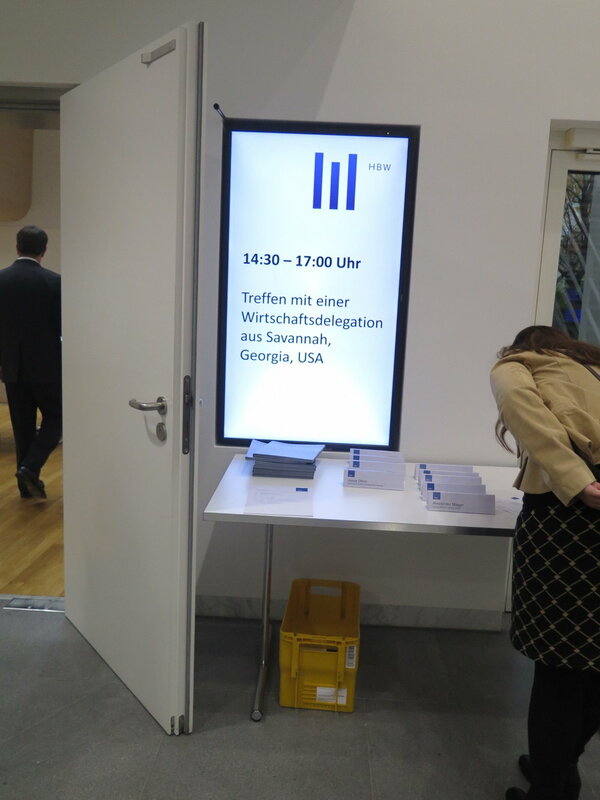 "What if all of your options were presented on the screen and you could take care of it in five or 10 minutes?" Caller YD can visually inform the consumer of who is calling and their purpose with an image and serve as an interactive platform to take care of something like confirming an appointment. "You would like to be able to do a lot of these things without talking on the stupid phone," he added. Anyone who has adopted a pet from elsewhere knows about the difficulty and cost of coordinating his or her transport. This is the story of a group of former and current truck drivers volunteering their time (and their homes and the cabs of their trucks) to transport pets around the country for free. The people I met behind it, led by Sue Weise of Prescott, AR, are driven by a sheer love of animals. It was great to hear their story and impressive to hear about the logistics they constantly wrangle. After hearing and watching the horror stories of Hurricanes Katrina and Rita in 2005, Sue Weise felt compelled to do something to help. She just didn't know what exactly. "I began praying, 'What can I do? I'm just a truck driver,'" she recalled. "I forgot to expect an answer when asking the Lord a question." The Prescott resident said she suddenly came up with the idea of truck drivers transporting some of the many displaced animals and decided to see if her peers would help. Weise, who had begun a second career in truck driving a decade prior, went on a truckers' talk radio show at the urging of her friends and daughters. She called in under her CB radio handle, Classy Lady, and asked if anyone would be interested in helping transport pets to their new homes across the country. People were interested. Operation Roger, as the nonprofit is now called -- named for a former rescue dog of Weise's -- has transported more than 900 pets since September 2005. Truck driver Jim Farmer holds Bruiser. Farmer is part of Operation Roger, a nonprofit that matches truck drivers with rescued pets for transport across the country. Potato sits in the cab of a big rig — ready for a trip across country with a truck driver who volunteered to take the rescue pup to his new home. While the interest has been mostly in dogs, the group will try to help just about any domestic animal, from ferrets to cats, rats to tarantulas. They successfully transported 12 rats once but, she recalled, were not able to make a 60-pound tortoise work. It all happens through a logistical nightmare of manually matching pets and their routes to volunteer truck drivers and their ever-changing schedules. Weise and her small team of volunteers also manage volunteer shuttle drivers to bring pets to meet the truckers and temporary foster homes for stops along the way. Transporting a pet can cost hundreds of dollars, but Operation Roger only requests a donation. "There's a $40 minimum, but you can give us more and we will just love you for it," she said. "It's tax-deductible and nonrefundable, but the transport is for free." Drivers must work for companies that allow pets, which many do. In Arkansas, for example, USA Truck, J.B. Hunt and Cal-Ark International are just a few with pet-tolerant policies. Jim Farmer has been driving professionally since 1982 and transporting pets with Operation Roger for almost a decade. He estimates he has had 70 to 80 of them in his truck over the years. "I've always loved dogs and had my own riding with me a lot of times. I'm just a real dog person," he said. "It's not about anything else but the dogs ... or the cats, sometimes." Operation Roger has to react to whichever drivers and pet requests they have in a given moment. After big storms or events, their pet requests increase, and over the years they've ranged from 10 to 60 drivers on the roster. "Life gets in the way," Weise explained. "People change jobs or maybe they decide they don't like all the hair." Every week their drivers send in their expected routes and locations so that Weise can try to match them with pets. The truck drivers' schedules take priority though, so animals may have to wait. "Sometimes it takes a long time. You have to wait for the right driver. That's the limitation that we have," she said. "We are here to help. That's all we are trying to do," she said. "It does take time though, because it has to be on the driver's schedule." Idella Hansen is an Operation Roger board member and a professional truck driver. "If we could not transport them, a lot of these pets wouldn't have a home," she said. "Some folks don't have a couple of hundred dollars to ship them on a plane and some of them are not transportable, like a lot of the pit mixes and the bigger dogs. We transported one last week who was deaf and real sensitive." "We do it for the love of animals," Hansen said. "Almost all of us have our own pets." If they can, they will do whatever to make it happen. Weise recalled one dog rescued from an abandoned house in Louisiana whose itinerary to Reno, Nev., involved six different handoffs over three weeks. At the beginning the dog was trembling, Weise said. "By the time she got to that last driver, she was all, 'OK, where we going next?'" A further logistical complication involves where drivers can legally park their trucks to meet foster parents or pet owners. Toni McQueen, who helps Wiese with the administration and logistics, said this is one of her biggest challenges. "I have trouble getting people to understand that truckers cannot just park in any Wal-Mart," she said. "Sometimes people just don't understand that [truck drivers] can get ticketed and towed. They can't go everywhere." Additionally, Weise said, there is no leeway in appointment times. "If you can't meet the driver when and where he or she says to meet, the pet misses the ride. If the driver has to go, he has to go. Drivers can't miss their loads." But the advantages when it works are wonderful, McQueen said. She discovered Operation Roger after a horrible experience transporting a rescued Boston Terrier. Someone offering professional pet transport nearly killed the dog after abandoning it for a week. "Truck drivers are usually in the truck alone," she said. "You can hear the excitement of their voices when they do get a new transport. They love it." "They've got company that otherwise they wouldn't have," she said. "It sure beats being in there by yourself the whole time." Plus, she explained, the enclosed setup allows for pets to be free of crates which makes for an all around better experience. "It gives them more one-on-one attention," she said. "That to me makes a more successful transport because you are more apt to catch it if one of them has car sickness or needs a bathroom break." McQueen and Weise thoroughly vet the applications of drivers and pet owners to try to avoid trouble. Drivers go through "Operation Roger University" training as well. The most important quality in a driver? A demonstrated love of animals. As for the pets? Operation Roger asks for total honesty on the application. If they are not housebroken, "We kind of like to know that," Weise said. We recently switched some things up at the business desk, and I have added coverage of a few other companies in Arkansas beyond my transportation beat. The biggest of these is called Acxiom, an Arkansas fixture that was one of the first companies to start compiling consumer data and managing and selling it to marketers. One of its early employees recalled to me how they would gather up phone books in the 1980s, cut out the pages and manually take photos of each as the source of their first data sets. At one time Acxiom managed the world's largest data repository. In fact, its data helped federal authorities track down the 9/11 perpetrators. It's a company you've maybe never heard of but, chances are, a company that knows a lot about you. They actually created a website where you can look up what they know about you here. Around Arkansas it is well-known as one of the state's early powerhouses of tech. To some though, it is viewed with bitterness as a company that for a period seemed to do layoffs every couple months. Given that it was (and still is) one of the largest employers in the area, those had lasting effects on central Arkansas. I have gotten a sense of that from many sources who feel betrayed by a company that appears to have pulled out of Arkansas and pushed into San Francisco and New York. Between that and its inherently complex business model, I think it's fair to say it has had a bit of an image issue in the state. Its CEO has decided he wants to change that and came to town to speak to me about what they are up to now, and how he hopes to bring Acxiom's Arkansas alumni back into its community. Scott Howe wants Arkansas to know that Acxiom is growing and he's excited about it. "We've always been known as the biggest company that no one's ever heard of in the marketing space," the company's president and chief executive said. "I'd much rather be the company that everyone's heard of that's important to every business in the world." Acxiom, founded in Conway in 1969 as Demographics, is a data management and distribution company that helps marketers more efficiently advertise and target customers. However, he acknowledged that over the years, "to grow, first we got smaller." In reference to previous statistics provided to the Democrat-Gazette, he clarified, "We just stupidly gave you wrong numbers about our head count, because we haven't laid off 90 people. We are actually up. One had interns in it and the other didn't." The company reports it hired nearly 50 people between December and March, putting its global head count at 3,261 at the end of its fourth quarter. "If you go back in time, five or six years ago, we were growing one to two percent a year. This past year we are going to grow about 10 percent. When I started, our market capitalization was less than $900 million. We had a $10 share price. Now we are at $2.2 billion," Howe said. Stocks trade at just under $30 today. He admitted that a long series of layoffs had already lent the company a negative reputation in Arkansas before he arrived in 2011. Its footprint has steadily shrunk since peak employment in 2007, when the company employed around 7,000 people globally and 2,700 in Arkansas. "We sold a bunch of businesses that were not core to what we do. They were kind of bolted on, and quite frankly, they were lower growth and less attractive businesses," he explained. "I would like to someday get to a point where people don't remember that this company ever had a layoff. I think there was a decade, quite frankly, where it was used as a performance management tool," he said. "That's no way to manage a business. That's not how we want to manage the business." Since centralizing its mission, he said, layoffs are no longer a common occurrence, though hiring and firing will "always" be a part of a business of Acxiom's size. Acxiom's Arkansas staff hovers around 1,500, the company said, almost all of whom moved to the Conway campus since the company sold its signature tower in downtown Little Rock in March to Simmons Bank. This also prompted a switch of corporate headquarters back to its original location in Conway. However, Howe said, the title of corporate headquarters means little to him. "I don't really care where the headquarters is. I also don't care where any of our executives live. In a modern corporation and a global company, you expect that people will live all over the world," he said. "If headquarters is defined by where the CEO sleeps, then headquarters should be defined as American Airlines seat 11C, the aisle exit row, because that's where I'm sleeping more often than not." Acxiom maintains 20 locations across nine countries. The 100-acre site in Conway is the company's largest, predominantly handling its well-known business segments: marketing services and audience solutions. Its newer connectivity segment, which grew 36 percent in the last year, is handled mostly out of San Francisco and New York. "As a whole we want to be where our clients are," Howe said. "So much of that [connectivity] business is about partnering with Facebook and Google and other companies that aren't headquartered [in Arkansas]." Despite that though, he said, Acxiom's Arkansan past remains at its core. "We will always be an Arkansan company. That will always be a part of our DNA. There is something about the central corridor of the Midwest and the people that live here. People say what they mean. They are honest, high integrity, high character people who can deliver the bad news as well as the good," he said. "It doesn't matter if we're hiring in Paris or London or San Francisco, we are looking for someone who fits those criteria. To me that's an Arkansan set of values, and that's the kind of values that we have." If grounded in "Arkansan values," where does the future of Acxiom lie? Howe said Acxiom today reminds him of Amazon when it first began expanding its business beyond books. "If you remember early Amazon, it was all tabs. The tab for books, tab for cosmetics, tab for sporting goods," he said. "The way they used to talk about it was their 'tab strategy.' We have this infrastructure. What's the next tab going to be? What's the next industry we're going to explore together?" Howe said he's looking for any industry with a lot of data, fragmentation and complexity to transform, as Acxiom has done in marketing. Like health care, for example: a highly bureaucratic, complex space, where each person's medical records are scattered across providers. He said that the average consumer has medical records stored with 180 different providers. "If I can have that data all integrated, I will have a better outcome as a consumer and my doctors will make better decisions about me because all my data will live in one place," he said. "All the stuff that we've perfected in marketing applies perfectly to health care, if we want to go after health care. It's just a matter of what makes sense for us to go do next." With this vision, the future looks bright to him. "I believe Acxiom can be so much more. I don't believe the best days of Acxiom are behind us," he said. "We are on a pathway now that's very exciting," echoed Allison Marr, product director and manager. She said that when she started at Acxiom about 20 years ago, the average employee was in his or her mid-20s, which is no longer the case. "Over these years we've stayed at Acxiom because we believe in this company. It has a great culture, it is people based, and we are growing. We are seeing that growth. There have been hiccups along the way, but the opportunity is tremendous today," she said. Another part of that pathway, Howe said, involves engaging the company's alumni better, particularly in Arkansas. "We are unique among other companies in the world because we have such a high concentration of alumni. We have to do a better job of bringing the alumni back into the family as well," he said. "The person who got laid off 10 years ago and doesn't even know what Acxiom is anymore is someone we've got to get to a community service event or an educational talk or something that makes them reconnect with their former colleagues here and makes them proud of having worked here. And we've got a long way to go on that." "Why do people stay here for decades? Because they love working here," he said. "They love the people they work for. They believe in the mission. The rest, ultimately, is noise. I think we've got to do a better job of sharing that." As I was driving my now-familiar route from Fayetteville to Little Rock, a sign on a building caught my eye with words I hadn't seen since Southeast Asia. A few Google searches later and sure enough, it was the site of the first Vietnamese company to open a manufacturing facility in the U.S.: Vinh Long. While they announced their expansion to Arkansas in 2013, it has taken them some time to juggle cultural and industry learning curves. They will finally start trial production this summer. After a winding series of emails, I ended up meeting with the bi-national team that's been pulling Vinh Long Arkansas, LLC together. The site will produce wooden furniture, primarily for IKEA, though the leadership team has big dreams to expand their U.S. business quickly. It was special to see these two worlds collide. Who would have predicted I'd be talking about bun cha and Phu Quoc in a warehouse in Morrilton, Arkansas? In 2013, the state of Arkansas announced that the first Vietnamese company to open a manufacturing plant in the United States selected Morrilton as its new home. More than three years later, the plans conveyed in that news release finally are becoming a reality. Vinh Long, a woven-products and furniture manufacturer based in Vinh Long province in Vietnam's Mekong delta, promised to invest $5 million at the site of the former Bosch factory on Telex Drive. It originally planned to begin production in 2014. While that timeline has been extended, so has the size of the investment, to about $15 million. The more than 200,000-square-foot building has been extensively renovated, has a new coat of paint and is just starting to fill with new manufacturing equipment. The company now employs 11 people and plans to begin trial production this summer with 25. Its owner, Phan Thi My Hanh, bought a house in the area. "They are definitely determined to make this business work," said Jerry Smith, president and chief executive of the Morrilton Chamber of Commerce. "The owner, Madame Hanh, is very much involved with it, and she takes everything about this project very personally," Smith said. "I appreciate that she is bullish, if you will, on Morrilton and the economy here. She really thinks this is a growing community." Hanh has family members in Maumelle and purposefully selected Arkansas for its slower pace of life and ease of access to the wood needed for furniture, said Le Thai Tinh, Vinh Long's sales director who is coordinating the setup of the American operation. He has been back and forth from Vietnam about 20 times, so far. "This is not only for business; it's not only to make money," he said of Vinh Long Arkansas. "Part of our mission is to create something here for the community." Of the 11 employees in Morrilton, three used to work in the same building, when it was the Bosch plant. When Bosch moved its production to Mexico in late 2012, 140 people lost their jobs. Vinh Long has been working with the University of Arkansas Community College at Morrilton to coordinate internships, recruiting and ongoing training programs for employees. "I think what Vinh Long is bringing in is a sense of high-tech," said Robert Keeton, division chairman of technical studies at the college. "Everything they're doing is going to be automated. They're bringing in some state-of-the-art equipment over there. Once they're fully operational, I think they'll be a pretty significant employer in Conway County." Of the delayed timeline, Smith said, "They have nothing other than the intention to do what they said. It's just taken them longer to adapt to the way things are done in the U.S."
Tinh said there was a steep learning curve between business in his home country and business in the United States. Specifically, he noted that there had been some miscommunication involving contractors and the renovation of the building. "The way of working with contractors here is very different. In Vietnam, they give you a quote at the beginning and that's what you pay at the end," he said. "But here, the price can end up being more or less than what they originally quoted." Additionally, the operation in Morrilton -- particle board furniture manufacturing -- was an entirely new segment for Vinh Long. Until now the manufacturer primarily produced woven goods in a 700-person factory and a 10,000-person team of weavers in Vietnam. Ninety percent of the company's business is done with furniture retailer Ikea. Hanh decided to expand her company into wooden furniture with a new workshop in Vietnam and in the U.S. at the same time, learning everything from scratch. Vinh Long ended up hiring a German consulting company to help figure out what machinery to buy and how to lay out its new facilities, also contributing to the delay. Smith said the company is "going first class on everything they do." He said that when people ask if it's ever going to open, "I say, 'They've spent too much money not to.'" "I'm just really looking forward to when they get going," he said. "It's good to see it all finally coming along," said Danial Evans, information-technology manager and Vinh Long Arkansas' third employee. "For six months when I first started we were just cleaning, painting and prepping. And all of a sudden machines are starting to roll in." Marc Roberts is working at the plant through an internship with the college, where he studies industrial mechanics and maintenance technology. "From what I can see here and from what I see of the people they're trying to hire, it's going to be great for the community and a great relationship between the two countries," he said. Mike Preston, executive director at the Arkansas Economic Development Commission, agreed that there are "some learning curves along the way for any country to start doing business in another." "It takes them a while to understand our customs and our traditions," he said. "Every country is a little different, and you're talking about a country halfway around the world." Vinh Long was promised an incentive package from the state once it employs 75 people. "Until then, we will help them however we can to get them to that point, as long as it's not monetarily," he added. Preston said Vietnamese companies "are just getting ready to take off" and have "a world of potential" in terms of global investment. He said the commission has two offices in Asia to help foster relationships with that part of the world. In 2015 Gov. Asa Hutchinson signed a memorandum of understanding with the chairman of Dong Nai province's People's Committee at a ceremony in Little Rock. The gesture formally declared a mutual desire to keep expanding the relationship between the state and the province just north of the country's capital, Ho Chi Minh City. Tin Nghia Corp., a major Vietnamese company in Dong Nai, opened a trade office in Arkansas about the same time. The Vietnam-U.S. trade relationship represented about $52 billion in both directions in 2016. It is the United States' 12th-largest import partner. While Vinh Long posted $35 million in export sales last year, it has ambitious plans to make that $100 million by 2020. The company hopes to quickly start diversifying its business through other opportunities in the U.S. market. "This is our future," Tinh said, gesturing to the Arkansas plant. The Arkansan Roots of a "Prince of Truffles"
Ian Purkayastha has captured the imagination of many around the country, with good reason. His is the story of a teenager who started foraging for mushroom in the Ozark mountains and long story short, now supplies truffles and other exotic foods to 80 percent of New York's Michelin restaurants. He's 24. Forbes called him the "prince of truffles," the New Yorker just published a profile and the Wall Street Journal and Planet Money have also done stories, to name a few. Oh and he just published a memoir. I interviewed him too, digging into his Arkansas story. While born in Houston, his family moved here while he was in high school, he made his first truffle sales in downtown Fayetteville and his parents still own a local restaurant. One of the reasons he likes his second home in the Berkshires, he told me, is that it reminds him of Arkansas. If you want to learn even more, consider checking out his book. As he told me, he used it as a way to "demystify" the story and industry, and he really lays it all out there in detail. In the forests of Northwest Arkansas, a teenage Ian Purkayastha first discovered his passion for mushrooms and rare, wild foods. Today the 24-year-old lives in Manhattan and is on track to sell $8 million worth of truffles, mushrooms and other exotic foods like caviar, wild greens and live seafood in 2017. His company, Regalis Foods, manages over 300 accounts nationwide, including 80 percent of New York's Michelin-starred restaurants. He also published a memoir, Truffle Boy, this year. Back in his midteens, Purkayastha and his family had just moved to Arkansas from Houston as his parents sought a simpler life amid the recession. His uncle, Jared Pebworth, an archaeologist with the Arkansas Archeological Survey, had been living in Fayetteville and taught his nephew to forage for mushrooms around a family cabin in Huntsville and all over the Ozarks, near Harrison, Goshen and even at Finger Park in Fayetteville. Purkayastha dug into researching edible mushrooms and ultimately became fixated on the truffle after tasting the rare, expensive delicacy for the first time on a trip back to Houston. It was a meal that would shift the trajectory of his life. "When he gets into something, he's very focused. He's always had this ability to take something he's learned and take it a little bit further," Pebworth said. "I never doubted that whatever he did he would take it to the next level." After saving up gift money, the 15-year-old found a French truffle supplier and ordered his first kilogram, intending to re-create that first truffle dish. He quickly realized a kilo was too much, so he put the best two truffles in his refrigerator, and his dad drove him to downtown Fayetteville to try to sell the rest to Ella's, Theo's and Bordinos restaurants. That inaugural $260 sale launched Purkayastha's first company, Tartufi Unlimited. The staff at the Washington County Courthouse had to check with a supervisor because they had never seen someone so young apply for a tax ID number to legally sell wholesale products. By the end of high school, the prospects of his truffle distribution business outweighed the appeal of college. Even though he had won an entrepreneurship scholarship, "I convinced my parents to let me move to New York, defer college and pursue this dream of selling truffles and mushrooms. I've been very lucky to have such supportive parents who have let me take this different path to education," he said. His parents, Lisa and Abhijeet Purkayastha , are longtime entrepreneurs (they operate Khana Indian Grill in Fayetteville) and championed their son's dream despite his setbacks, including when he was beaten and robbed on his third day in the city. "I think any other parent would have made me come home right away, but they were supportive and encouraging," he recalled. "That has really been the success in this whole thing: having a strong foundation in my parents and a strong support system. Without that it would have been impossible to achieve any of this." Pursuing his dream to "make it big in New York" came with even more challenges. Purkayastha was only paid commission by the Italian distribution company he sold for. He lived in a bad part of Newark, N.J., his office was above a methadone clinic without air conditioning and he had to "fight for every order," initially facing a lot of rejection. Eventually though, his persistence, reliability and the high quality of his truffles won over some of New York's best chefs. "I assumed that if I continued pushing through and continued to hustle that I would become successful someday," he said. "It obviously took a long time, but it got to a point where people started reordering truffles and started trusting me. The cold calls turned into restaurants calling me wanting to do business with me." In the six years since, Purkayastha has learned a lifetime of business lessons. He has had suppliers swindle him and undergone many logistical nightmares, from a shipment getting incinerated at customs because of suspected bug infestation to having a car towed, full of truffles to be delivered. He had to include money for parking tickets in his budget and ended up parting ways with the Italian distribution company as well as his original Regalis Foods business partners once he realized they were undervaluing him. Today, he says things are finally stable. Before, Purkayastha recalled living a lonely life "in a depressive state, working myself to death, 18-hour days, six days a week," but now he has seven employees and four delivery trucks. He lives on the Upper West Side with a second home in western Massachusetts. While he estimates he is the third largest supplier in the country, "there is endless competition," he said. "Every year is harder and harder" as more people try to break into the lucrative market. "We're constantly trying to find that next big thing," he said. Over the years he has gotten threats, had his tires slashed and had competitors approach him to price fix the market. Truffle smuggling is also a problem, he said, given the ease with which someone can slip some truffles in a suitcase. Regalis' competitive edge, according to Purkayastha, came from several directions. First, he said, he has always been militant about the quality of his products. "Everyone assumes that because they're very expensive, these products will automatically be high quality. That's just not the case." He sells an ounce of Italian white truffles for $230 while French Perigord black truffles are $65 an ounce. "We have to literally inspect every single truffle that arrives," he said. Additionally, thanks to some excellent timing, he was on the cutting edge of the recent foraging movement among high-end restaurants. "I started foraging when it wasn't hip and fashionable with my Uncle Jared in the Ozarks," he said, explaining that Regalis, founded in 2012, differentiated itself with its variety of foraged products. "I got into these kitchens not with the truffles but with these other foraged, wild plants and mushrooms. The truffle business was kind of a trickle-down," he said. Ultimately though, Purkayastha's identity has become enmeshed with those truffles. He called his memoir Truffle Boy, after all. While he says he definitely does not eat truffles every day, and some days he feels "smothered" by their powerful smell, "I still love truffles. I still get excited when we get a new shipment." "I tell people all the time truffles are the last natural ingredient left on earth. Nothing else is almost exclusively wild." Truffles have not been commercially produced on a large scale, adding to their cachet and expense. Back in his teens, Purkayastha had an idea for his Fayetteville neighbor and general surgeon, Wayne Hudec. "He came to me very professional-like and said, 'Dr. Hudec, I have a business proposal for you,'" Hudec recalled. Purkayastha suggested that his neighbor invest in trying to grow truffles at his farm, Hazel Valley Ranch, that Purkayastha could later distribute, with an equal profit split. They shook hands on it. It has been six years, so Hudec and Purkayastha suspect they have some truffles under hazelnut trees by now. They are looking for a truffle-sniffing dog to locate their underground harvest. "He's gotten a different kind of higher education in the world of unique foods," Hudec said. "He's just grown by leaps and bounds. For him to be a success at his age, I'm just proud as hell." Purkayastha never made it to college. He ended up returning his scholarship money when it became clear scheduling wouldn't work. His rejection of the "traditional" educational path to success had an effect on his former creative writing teacher at Fayetteville High School, Boyd Logan. Last year, Logan founded the Future School charter high school in Fort Smith with the goal of cultivating students' extracurricular and professional passions. Each week students spend a day at internships wherever they choose. "Ian was the turning point," he said. "I realized that at school we were cutting kids capable of all this crazy stuff off from those passions. Ian would leave and do what he was most passionate about after school, versus us cultivating that passion at school." Purkayastha's business continues to grow. He has opened Regalis Texas after acquiring an exotic foods company in Dallas, and Williams Sonoma now carries Regalis truffle oil, butter, salt and sauce. However, he's proceeding cautiously. Given the trust each of his transactions require, his profit is rooted in relationships, which makes expansion tricky. "The success of the business is the personal relationships with the chefs. You lose that the larger you get. I'm walking this fine line between wanting to scale up and putting the brakes on, because I don't want to lose track of what has made me successful." He still forages whenever he has a chance at his property in Massachusetts and with his uncle in Arkansas. "Wherever we go, it turns into foraging," Pebworth said. "I'm glad Ian was paying attention," he said of those first foraging trips in the Ozarks. "I like the fact that in such a modern world, he's bringing a little bit of nature to the city." In an unlikely place about an hour into the Arkansan countryside, I met some incredible people making exquisite art. Heidi and Christian Batteau run a global company from a converted seed mill off a two-lane road in the Ozark Mountains, while living off their own farm nearby. 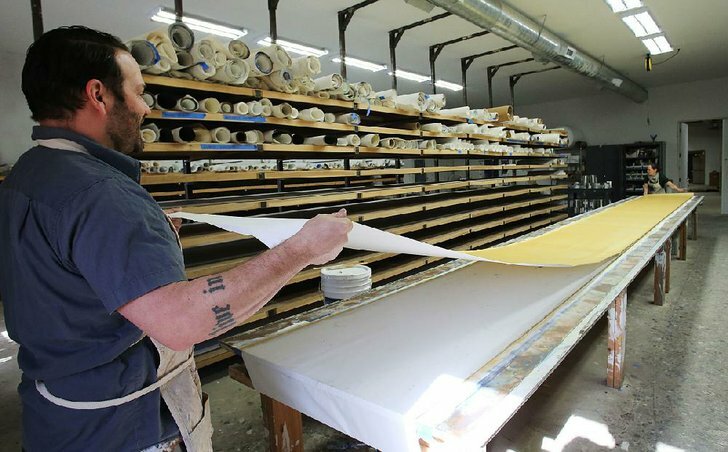 They've developed a unique way to hand-make custom, high-end wallpaper, and their work hangs in 19 countries on the walls of the homes of A-list celebrities, luxury hotels and stores like Louis Vuitton, Chanel and Tiffany & Co. Since they rarely allow visitors to their studio, I was honored to see it. I can vouch that they are the "real deal," and if you're in the market for beautiful art to paper your walls with, look no further. While I don't know if photos can do their work justice, you can find even more images at their website. In a converted seed mill off of Arkansas 23 in the Ozarks, Heidi and Christian Batteau are at work hand-making luxury wallpaper and shipping it around the world to the likes of Tiffany & Co., Saks Fifth Avenue, the Koch brothers and Chanel. 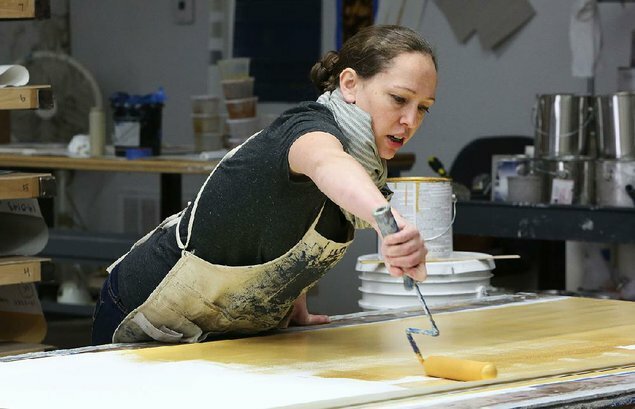 In 2011 the couple left successful careers in textile design and sculpture in Brooklyn, N.Y., and moved to Heidi's native Witter to pursue their dream of living off of their farm and developing a unique way to make custom wallpaper. Their work, which can cost anywhere from $60 to $400 a yard, now hangs on the walls of homes, hotels, offices and stores across five continents, including in four of the world's top 10 tallest buildings. And their company, Assemblage Inc., shows no signs of slowing down. Christian and Heidi Batteau create hand-crafted luxury wallpaper in a converted seed mill in Madison County. After Chanel asked whether it was possible to replicate a piece of fabric in wallpaper form in 2004, Christian Batteau, 42, set to work trying to find a way to do it. The Los Angeles-native studied sculpture and spent time working for contemporary artist Jeff Koons but said he has been working with plaster and painting "to support my sculpture hobby" since age 17. Most handmade wallpaper is applied directly to the wall, which requires paying expensive crews for weeks to install on-site. With that process it is also impossible to produce the kinds of designs like the Batteaus now make, because gravity causes them to drip. He tweaked paint formulas and experimented with different kinds of paper until he found the perfect formula that would be able to handle heavy products like layers of marble dust plaster, precious metals, beeswax and lacquer and not crack when rolled up for transport. They eventually ended up with the perfect recipe that has allowed the Batteaus' business to take off on a global scale. Unlike traditional bespoke -- or made-to-order -- wallpaper, their product can be shipped anywhere and takes just a day to put up. Their adopted home in Arkansas has made the business and their current lives possible, they said. "We could not be doing this in New York," said Heidi Batteau, 35. "It's a competitive industry, and we would have to charge more to pay our artists a livable wage. If somebody is coming to work for us on contract, it's got to be worth it for them to be flexible with the production schedule. In New York we were paying people $20-$25 an hour. The profit margin was low, and you can't even live well on that wage in the city." They have had two children since they moved, something they say they couldn't find a way to do in New York, given the costs and space constraints. Batteau grew up in Witter, an unincorporated community in Madison County. Her mother, Betty Blackwood, still owns and operates a hand-crafted textile company, Dogwood Designs, in Witter. "I knew there was a large craft movement here. There are a lot of people here supporting themselves by making things," Batteau said. "You see that and think, OK, we can do this. We can go out there and make a living." "Although," she qualified, "it was a lot scarier once we actually got here." While their best year so far has yielded $850,000 in revenue, it took time to see numbers like that. "Brand equity is way harder to generate than I realized," Christian Batteau said. "When you have a new brand, big architecture firms are reticent to place purchases from you, because they're trying to see whether you survive." "We had to wait that out. It took two years. And in the meantime, we were doing anything to make a living," he said. "I was chopping wood on the side to pay the people working for us." "You constantly wonder, should we just say it's done and go back?" Heidi Batteau recalled. "But you've got to try and keep your positive attitude." As to why he stuck it out, Christian Batteau said, "I believed in the dream. It sounds ridiculous. But I believed in being able to have our sustainable life, grow our own food, hire people for a livable wage and make beautiful work." Recently, with help from international sales representation, the Batteaus' business has expanded beyond exclusively custom orders to existing designs people order specifically. "It has made the business steadier," Heidi Batteau said. Another component of their customer service is "value engineering," Christian Batteau said. "By removing some of the more expensive layers like marble dust plaster, someone like Banana Republic can afford to buy a design, instead of just a Chanel," he said. "We are an art studio," Heidi Batteau said. "We'll do anything. If someone comes to us and says, 'Can you do it?' We will do it." Their flexibility and willingness to customize has proved one of their strongest selling points. They have taken things like fabrics, tortoiseshell and leathers and interpreted them into complex wallpaper design, and they have taken complicated and expensive designs down a notch for smaller budgets. "They're so approachable even though they're producing this really beautiful, luxurious art," said Nancy Winston, general manager for the Texas showrooms of Holly Hunt, a company that designs and manufacturers home furnishings and also represents Assemblage. "They've done installations for the likes of Louis Vuitton, but you can create your own little jewel in your powder room or bathroom. For example, they use a lot of precious metals, but there are alternatives if budgets don't allow for that." "Assemblage is one of my favorites to work with because they are so hands-on and passionate," she said. "It makes it fun. You can feel how committed and detail-oriented they are, and you just know it's going to work for a client. Mistakes don't happen, because they are so detail-oriented." There are almost no other businesses around the world producing work like the Batteaus. Most wallpaper is printed nowadays. Christian Batteau said that even when he tried to outsource orders when it was particularly busy, he could not find a competitor willing to do the same work at the same price. "It's a lost craft," he said. The more the Batteaus are doing this, the more orders they have received -- more than 400 as of now. These early weeks of 2017 were supposed to be quiet for them, but they suddenly have five rush orders on their hands. "It's finally started to really take off in the last six to eight months," Heidi Batteau said. They've had to hire artists from around the area to help, but they have long-term dreams to bring on even more. They are interested in someday exploring furniture and lighting design and expanding their production studio into a co-working space for other craftsmen. In the meantime, they continue to run their global company from Arkansas 23, but they hope to increase engagement with architects and interior designers closer to home. "We interact with the world constantly. This morning I was interacting with Chanel in France," Heidi Batteau said. However, she said, "I would love to be able to have more local support and work." "I think people don't know that we're here," Christian Batteau said. "We really are engaged globally, but the local thing is a piece of the puzzle we've just been starting to cultivate." Idella Hansen learned to drive at age 11 and started in commercial vehicles at 18. As you can read in the story below, she's driven nearly every kind of rig imaginable all over the country. She's now 66 and as passionate as ever about her life's work. She currently drives for a specialized company hauling extremely high value cargo and carries a .357 Magnum to protect it. We had a fun three hours talking about everything from the "talking books" that keep her mind busy on the road to widespread abuse of student drivers by trainers. I'm really happy to have gotten to know her and to have been able to tell this inspiring story of a true "trailblazer." Hansen, a professional truck driver, has been driving since she was 11 years old. She recently talked about her years on the road at the Iron Skillet restaurant in the Petro Truck Stop in North Little Rock. Much has changed over the course of Idella Hansen's life, but one thing has remained constant: a love for driving. The Camden resident first learned to drive a car at age 11. She had an elderly neighbor who liked to go to the roller derby, but he couldn't see well enough to drive at night. So he put her on the edge of the driver's seat of his 1941 Chrysler. "If I saw an 11-year-old driving a car like that now, I would have a heart attack," she said. "But he made me go fast. I learned how to drive, and I've been driving ever since. It's just second nature to me. I knew then that that's all I ever wanted to do: drive." Now -- at 66 -- she hauls high-value cargo for IBI Secured Transport in a team with her longtime boyfriend and driving partner, John Smith. Transporting valuable cargo means they are licensed security officers who carry .357 Magnums for protection. During her life she has driven a wide range of equipment: log trailers, a wrecker, an open-top wood-chip van, refrigerated trailers, dry van, flatbed, a dump truck and a school-bus van. "If it'll crank," she said, "I can drive it. It doesn't make any difference what it is. It can be a front-end loader." Beyond the breadth of her career, Hansen started driving when there were even fewer women on the roads than the minority driving now. The Bureau of Labor Statistics estimated women made up about 5 percent of the occupation in 2015. "I just think that she's a superstar," said Desiree Wood, a fellow driver and friend of Hansen's. "And I know a lot of other people do, too. She deserves an enormous amount of recognition as a pioneer and a trailblazer that all women in trucking should look up to." Hansen graduated from high school early to start driving a five-speed transmission straight tanker for her then-husband's family's bulk-gasoline plant. "To this day I'm not really sure I knew what I was doing," she said. "I taught myself how to drive. Everything I did was self-taught." In 1968, a pregnant, 18-year-old Hansen and her husband moved from her native California to Morrilton, where his parents were. They eventually bought a cab-over tractor and a dump truck, and Hansen was back on the road. While her children were young, she stayed on local routes, which had her home every night. She wasn't even deterred when she accidentally fell into an open-top trailer full of wood chips when trying to pull a branch out. It took an hour for someone to hear her and open up the trailer. "I don't think you can drive a truck for as long as I have without a sense of humor," she said. "You can't let things bother you. You've got to laugh it off. You've got to be able to laugh at yourself." By her late 30s, she had gotten divorced, her children were grown and she had been driving most of her life. She was a perfect candidate for over-the-road driving. Around that time, Prescolite in El Dorado realized that to win a government contract, they needed to hire a black person and a woman. Hearing of her reputation as a good driver, Hansen was offered a job, "a great job," as she called it. She took her first driving test in a pair of heels. "From the very beginning," she said, "they treated me with respect and equality. I would still be there if they still had jobs." "My first trip was to Pinebrook, N.J. I had never driven that much interstate all wrapped up in one trip in all my years working local." While she has few complaints about this stint, she did face one challenge: Because they didn't have permanently assigned trucks, other drivers would often take hers because she kept it extra clean. So, she decided to buy some chrome decals with the silhouettes of naked men and put them on red mud flaps. "My truck was always there from then on. Nobody took my truck again. I ran with men on my mud flaps for years and years and years." After a decade she bought her own truck and became an owner-operator until a stint at Tyson Foods in Springdale. While it was "an education" in electronic logs, PeopleNet communications software and driving an automatic transmission, "the [refrigerated] unit isn't for me," she said. Soon thereafter she was offered her current job in secured transport, which has allowed her and Smith to work together. They stay out for three to four months at a time, traveling all over the country. This doesn't stop her from staying actively involved with four different trucking-related nonprofit groups, including Real Women in Trucking. Wood, the group's founder and president, connected with Hansen over social media, and they quickly became friends. "There's something about Idella that draws you to her," Wood said. "She's just, to me, very motherly and comforting and soulful. She's very charismatic, and people are drawn to her. She also, of course, has got a lot of driving experience." Wood explained they connected over shared personal experiences, too: "She was a single mom for a lot of years, and I was, too. There's a certain amount of struggle, hardship and heartbreak you go through when you live that life, when you're the one putting the food on the table, you're the breadwinner, you're the mom, you're the dad," she said. "It's really an inspiration that she's still out here working the way that she does. ... And she quilts!" "I tell my friends all the time that my grandma is a trucker. And they say, 'What?!'" said Hansen's grandson, Isaac Barr. "Everyone else's grandma is sitting at home, watching TV, calling other people on the home phone. They don't even have cellphones." At 66, Idella Hansen has made truck driving her life. Hansen definitely has a cellphone and praised the role social media and connectivity have had in opening up the lives of truck drivers and keeping them occupied. She said that now "I couldn't survive without my talking books!" She admitted it's still a "lonesome job," but not as much as in the past. "One time, I was going across Columbia River Canyon. We didn't have cellphones. I was by myself. I saw a triple rainbow. I wanted to tell someone. I wanted to show it to somebody. I don't have the words to tell you what it was like. I wanted to have the means to share what I was seeing. I stood there, and I cried because I couldn't share it." Now, she said, that's not as big of a problem, thanks to camera phones and the internet, though sometimes she still gets lonesome, even with her partner in the truck. That's when she connects her ever-present headset and calls someone up, she said. Hansen has seen a lot of changes to her industry over the years and hopes to leverage her experience when she stops driving. One idea is to become "a trucking tutor." Right now, there is a relative gap in the industry for this kind of further training, Hansen said. There are drivers who have had to abandon training midway because of trouble with intimidation, exploitation or harassment by trainers. Often these trainees are left in debt to a company or left without enough experience to get another job. In addition, there are more experienced drivers who'd like to work on something in particular, like backing up. As Hansen put it, "I don't know if you've ever backed up a trailer before, but they get away from you." Wood and Hansen have long-term hopes to put together a certified training program like this within Real Women in Trucking. "When I started, I got pushed out on the road so fast. I didn't want to be an irresponsible driver, but that was just the way that it was," Wood explained. "I still struggle with things and wonder if I'm doing it right. I would just love the opportunity to be in the truck with someone like Idella who could say, 'You could make it easier on yourself and the truck if you would do it like this.'" Hansen attributed her deep knowledge of her line of work to the chances she has had to make mistakes. "If you don't make a mistake -- get lost, make the wrong turn, pull in somewhere thinking you can turn around -- if you don't make those mistakes, then you're not driving," she said. "It's part of life. I still screw up. I miss turns all the time. It's not fun screwing up in New York City, though. That's nerve-wracking."